Well, I have TBW (The Biggest Winner) after work today. I’m still having some really weird and killer pain in my right hip. I’ve thought it was a sciatic nerve thing. Then it moved to the front of the joint and I’m thinking it’s a tendon issue. Now I’m worried that it’s a side effect of Questor and I’m going to blow some connective tissue and be crippled ’til I’m put back together. Sigh, I’ll talk to Dr. Fretz tomorrow. It will be something to talk about other than my weight (not good, 1/2 a lamb burger on a pretzel bun was actually too much and it came with a sundae, try to take one of those to go). 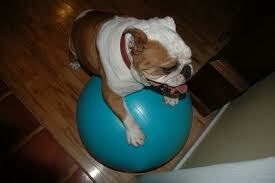 I’m thinking of getting an exercise ball to sit on at work. I like using the one at the gym and the chairs at work are painful to get out of. I would put a couple of pounds of sand in it before blowing it up so it wouldn’t roll away so much. But I think it would be great to sit on and I could get my core and thighs a little stronger. But I worry about the silliness factor. As you can tell by things I’ve written, I’m a very serious woman. ~ by 1fatgirlshrinking - Diane Kirby on March 6, 2012.